Instagram is going to start pushing you to watching more videos, rolling out a new section in its Explore tab that will recommended clips. Users in the US have been playing with this feature for several weeks, but from today the rest of the world will get a new channel called "Videos you might like" which will sit at the top of the Explore page. Explore is Instagram's tool for helping you find pictures you might like from accounts you don't follow, and that now applies to videos too. Tapping on the video preview at the top of the page will take you to the full clip, from where you'll be able to scroll through a reel of further videos that Instagram reckon you'll appreciate. The scrolling list is very Facebook-esque, which is probably no coincidence given that Instagram is owned by the big blue social network. 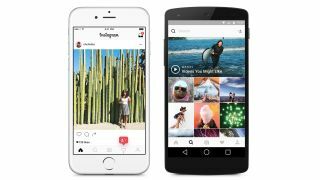 A spokesperson told TechRadar that Instagram has recently seen a 150% increase in people watching and sharing videos, and that its latest feature is a response to that. Instagram also promises to launch more dedicated event-focused channels in the future, following one that was run earlier in the year for the Brit awards. Expect to see "Featured" channels for the Olympics, Coachella, Cannes Film Festival and more. As for now, the new update update starts to roll out globally today, and you won't even need to update the app to see it. In fact, some of you may have noticed the feature pop up in the last 24 hours - Instagram has been trailing the feature to select users.